We are delighted to announce the three keynote speakers for IEEE MASCOTS 2017. There will be one keynote speaker on each morning of the conference, in the order indicated below. Biographical Information: Bala Chidambaram manages a Cyber Security and Network Technology organization in Boeing Research and Technology. His group develops advanced cyber security and networking technologies for commercial and military applications, e.g., embedded system (software) security, mobile device security, mobile ad hoc networking protocols for the tactical edge, simulation/emulation environments for networks, networking infrastructure for soldier handhelds, and reliable networking for commercial aviation. Prior to his current assignment, Bala managed a Networked Decision Systems group. His team developed software and mathematical modeling techniques for rotorcraft and other platforms in areas varying from logistics to sensor network optimization. He has a bachelor's degree in Engineering from the Indian Institute of Technology, Madras (India), a Ph.D. in Engineering from the University of California at Berkeley, and an M.B.A from the University of California at Los Angeles. He recently completed an Advanced Cyber Security certificate at Stanford University. Abstract: Netflix is a global internet TV network that has recently crossed the 100 million member mark. The resulting video streaming traffic accounts for tens of Tbps worldwide and is responsible for over one third of peak internet throughput in North America. Netflix Open Connect is the content delivery network responsible for delivering Netflix TV shows and movies to our members worldwide. The Open Connect data plane is made up of thousands of appliance servers that are hosted at internet exchange points as well as embedded within ISP partner networks. These appliances are orchestrated by the Open Connect control plane, a set of web services that run on Amazon AWS. In this talk, we will go over the architecture of Open Connect and the performance challenges associated with large scale content delivery of streaming video, covering both control and data planes. Biographical Information: Alex Gutarin is a Director of Engineering at Netflix responsible for Open Connect Appliance software development. He has been working on internet TV for over 8 years, starting at Hulu in 2009 and then at Netflix in 2012. His areas of interest include operating system and web server performance optimization, network transport protocol research, and adaptive video streaming. Prior to getting interested in internet TV, Alex worked on several search engine and server OS projects at Microsoft. He holds a BS in Electrical Engineering and Computer Science from UC Berkeley. Abstract: IoT (Internet of Things) is expected to create a hyper-connected world of "things" that, together with the embedded intelligence and controls, will realize the promise of "the world at one's fingertips". The promise is unprecedented: "programming" and "controlling" an integrated cyber-physical world to improve our quality of life. Massive connectivity, however, dramatically increases security and privacy threats. Attacking a small edge device could have catastrophic and far reaching effects when it is attached to a highly connected Internet. Similarly, aggregation and analysis of the many streams of data generated by a sensor-heavy world, will have unimaginable privacy consequences. This talk explores the challenges of security and privacy in the age of IoT. 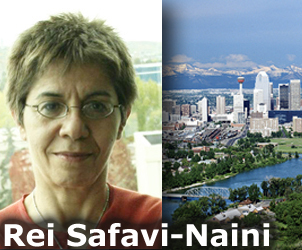 Biographical Information: Rei Safavi-Naini is the AITF Strategic Research Chair in Information Security and the Director of Institute for Security, Privacy and Information Assurance, at the University of Calgary. Before joining the University in 2007, she was the Director of Telecommunication and Information Technology Research Institute (now ICT Research Institute) at the University of Wollongong, Australia. She has co-authored over 350 articles in refereed journals and conferences, and served as Associate Editor of ACM Transaction on Information and System Security (TISSEC) and is currently an Associate Editor of IEEE Transaction on Information Theory and IEEE Transactions on Secure and Dependable Computing as well as IET Information Security and Journal of Mathematical Cryptology. She has been Program Chair/co-Chair of ACM CCSW 2014, Financial Cryptography 2014, ACNS 2013 and Crypto 2012 and is a founding member of the Steering Committee of International Conference in Information Theoretic Security. She has given numerous keynote and invited talks at conferences and workshops, most recently, IWSEC 2014, PST 2014 and PLLS 2016. Her current research interest includes cryptography, communication and network security, cloud security, and privacy enhancing technologies.